There is no denying the nostalgic quality of King’s Potong. For 40 years, King’s has served delicious ‘Potong’ frozen confection that is loved by many. It brings back fond memories of the good old days with Asian-inspired flavours. With the same trusted quality, King’s Potong Gold range promises to delight the palate with quality ‘Potong’ made from only fine quality ingredients. Consumers can now savour a taste of heaven with the new Mao Shan Wang Ice Confection by King’s Potong Gold. Made with 100% Mao Shan Wang puree from Malaysia and free from any artificial flavouring, a stick of this icy goodness is as good as it gets. Durian connoisseurs will be thrilled with the bittersweet goodness and seductive aroma of this icy treat from King’s Potong Gold. The infusion of coconut milk adds an additional dose of richness that is sure to impress even the most discerning palate. For many, a serving of durian is a slice of heaven that titillates the senses. Under that intimidating thorny husk lies an amazingly creamy, custard-like flesh of sweetness that has earned this fruit the unrivalled title of ‘King of Fruits’. While there is a wide selection of grades and types of durians available in the market, many durian aficionados will nod in agreement that Mao Shan Wang Durians top the list. Its bittersweet, velvety flesh with a tinge of gold is what makes this grade of durian one of the top, if not the best, durian in the market. To ensure that the new Mao Shan Wang Ice Confection by King’s Potong Gold is always made with 100% Mao Shan Wang puree from Malaysia and free from any artificial flavouring, their sensory panellists adopt a sensory taste method to establish the clear differentiation between normal mixed species durian and the Mao Shan Wang species. The sensory method ensures the consistency of the profile of every incoming batch of durians which we source from a supplier with the necessary credentials. The quality control team also visits the supplier on-site annually to ensure that compliance to food safety and quality of the product supplied are adhered to. 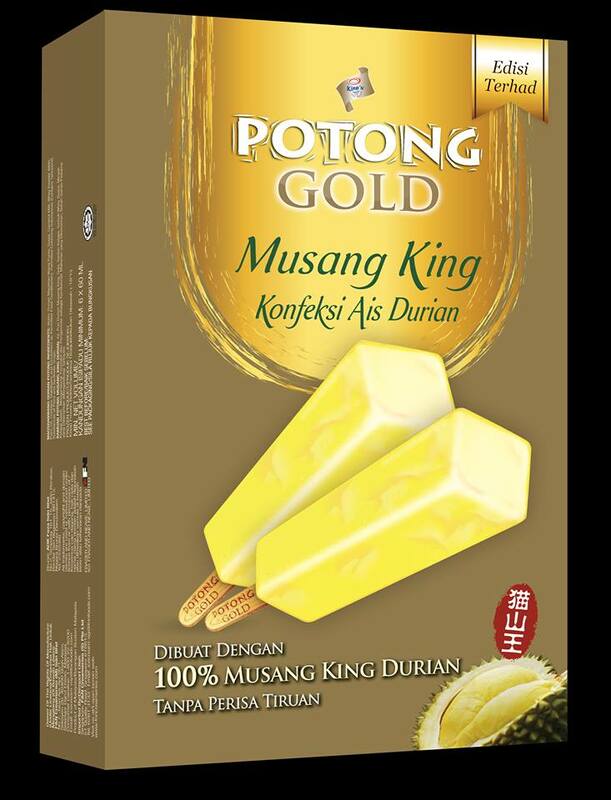 The limited edition King’s Potong Gold Mao Shan Wang Durian Ice Confection will be available from April 2016 at leading supermarkets, hypermarkets and selected convenience stores for RM3.80 a stick (60ml) or RM21.90 for a box of six sticks.